Perfect, A-Grade, large, soft indigo/blue Celestite crystal on crystalline matrix from Madagascar. The main crystal termination has a beautiful light-bearing rainbow at its heart. 'In the flesh' this specimen is very bright, clear and sparkly - the picture does not do it justice! 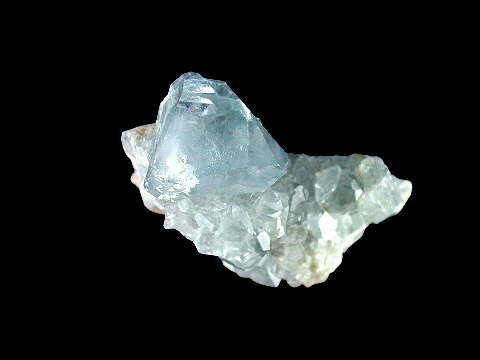 Celestite has a high vibration and is a teacher for the New Age. It is imbued with divine energies. It takes you into the infinite peace of the spiritual and contacts the angelic realms. It jump-starts spiritual development and urges you toward enlightenment. It brings a vision of peaceful coexistence with the whole of creation and holds the possibility of total harmony. Excellent for developing natural psychic abilies and also for connecting with your guardian angel or the angelic realm as a whole. It disperses stress and worry, calming and soothing the nerves. It takes its common name from its sky blue colour (celestial). Its mineral name is Strontium Sulfate, from the Sulfate class of minerals in the Barite group. It's associated with Gypsum and Fluorite.